September 10, 2015 / Heidi B. As Heughligans, we strive to do good things with our Fandom. We regularly fundraise for leukaemia & lymphoma research (Bloodwise, a UK charity supported by Sam) and Youth Theatre Arts Scotland (for whom Sam is a patron). Now we are asking for your help (not your money) in supporting a charity which provides information and education about male cancers (testicular cancer, prostate cancer, and male breast cancer), Cahonas Scotland. 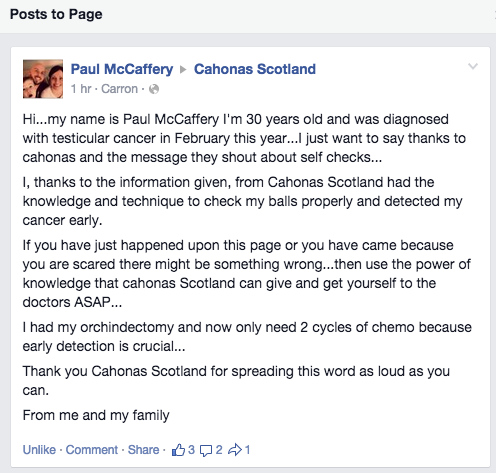 Cahonas Scotland “exists to educate the public in matters relating to male cancers, reducing discrimination and stigma.” Testicular cancer is the most common cancer affecting young men aged 15-35. Testicular cancer is also one of the most treatable types of cancer if discovered early; and over 95% of men can be completely cured. By doing this, you’ll be casting a vote to fund this worthy charity and bringing awareness to male cancers. Protect the Jamie in your life, encourage monthly self checks and visit the doctor early. Education saves lives. Visit http://www.CahonasScotland.com for more info.